Want to see the world’s ugliest law firm website? That’s what Kendall Coffman’s FindLaw website looked like on Tuesday. What follows demonstrates how Kendall was able to get his site (admittedly stripped down) back up and running with 21 hours. I receive an email from Kendall. I have been in a dispute with Findlaw for several months now, and Findlaw has decided to “take down” my website. 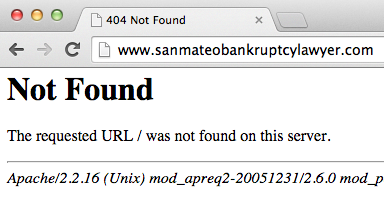 My site was www.sanmateobankruptcylawyer.com, and if you go there, you will see nothing except maybe error messages. Kendall is locked in to a long term contract with FindLaw after moving his website from a self made 1&1 website. He’s become increasingly concerned over the decline in performance of his FindLaw site – and has been in an ongoing dispute over the fees he’s being charged and the site’s underperformance. Now I think that part of Kendall’s problem is entirely exogenous to FindLaw – as the real estate market and economy have picked up, the demand for his specific practice area has declined. But, Kendall is concerned that his site was hit by Panda 2.4 in September 2011, but unfortunately FindLaw hasn’t installed Google analytics on his site – despite his bringing up the issue – so this is just conjecture at this point. He’s also concerned the backlink package he purchased from FindLaw has resulted in low quality links which may be impacting the site negatively. However, it seems that FindLaw has viewed his inquiries about his site’s lagging performance as an upsell opportunity. We go over the services Kendall is receiving. His monthly bill is $1,519.44 and includes FindLaw Premium Profile ($59.40), FindLaw Firmsite 333 C Website Package ($628.95), Findlaw FS Web Advantage Starter Plus ($348.36). At one point he was sold on blogging and added FindLaw Post Plus Firmsite and FindLaw Blog Service Starter FS ($433.60 for 2 blogs a month). FindLaw has pulled Kendall’s current website and it is currently returning an error. The site, unfortunately is registered to 1&1. Our immediate goal is to get a barebones website back up and running. We’re going to launch a very simple, scaled down version TOMORROW. On our plate: build out a 5-6 page WordPress website from existing template; hosted on WPEngine. Redirect old pages (there are 93) to homepage. We think Kendall does NOT own any of the content, so he is going to have to rewrite it within our shell – we’ll need to provide him with the WordPress Guide. Kendall is sending us information on his 1&1 logins. We do NOT think there is an existing GA account – so should probably set that up as well. Mockingbird Design and Development used a preferred WordPress Theme and applied an existing basic design template. Utilizing the Wayback machine they were able to view Kendall’s FindLaw site (prior to the plug being pulled) and reviewed the general layout, imagery, content map, color schemes, logo and vital content like address, phone numbers etc. Instructions emailed to Kendall along with the site and log-ins. I would also suggest not to edit anything if you are not sure what that edit will do. With that said, I have set up some basic menus and pages for you to see how WordPress works. Attached is a basic WordPress Editing guide. This should help you create and edit pages. Below are the old and new sites. I might be a little biased but I think the new one looks just a little better. Replace the FindLaw tracking phone numbers with his primary number. Change the email address on the contact form on the site. Mockingbird Design & Development completes requested changes and modifies 1&1 registrar records to point to our WP Engine hosting solution. 21 hours after Kendall discovered that FindLaw had pulled the plug on his website – he’s back up and running. You can now see it here: site. Its admittedly a stripped down version from a content perspective; but professional, functional (responsive) and much better looking than a 404. A few search queries and it looks like the downtime hasn’t decimated his search engine performance. Over the next hour, we finish the process of redirecting the old URL’s. Now, because the site is built on the ubiquitous and easy to use WordPress platform, Kendall can add much of the content himself without being beholden to a vendor’s proprietary platform. And if he wants further help on it, he can contract with one of the tens of thousands of professionals who work on WordPress throughout the US. If you are concerned about your own FindLaw site, download the FindLaw Jailbreak Guide to carefully plan your escape. Great work Conrad! I am still amazed that lawyers even consider using Findlaw. Hopefully the word will continue to spread. Hi, great post! I am in the middle of doing the same exact thing for my client. However, this is the first I had to deal with FindLaw. Using WordPress has already saved me a lot of time. However, I have one burning question. though: Can I use my client’s “practice area” pages without worrying about a lawsuit from FindLaw? I understand their contract mentions “Practice Pages” as being copyrighted as their own. I’d like to scrape what was there before and at least use that for the short term. Is this ok or do I need to re-summarize each “practice area” page? Hi Paul – I think you need to have your client very carefully read through their contract and see what rights you have to any content written by their previous company AND even written by themselves on their site. Gyi Tsakalakis has a good write-up on the content ownership issues here.